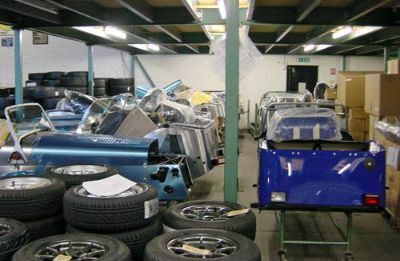 First port of call was a storage area to the side of the assembly factory, where kits, chassis, engines, parts and tyres are stored. Oh for a 'Supermarket Sweep' opportunity in here! 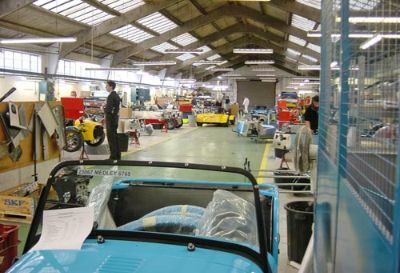 All Caterhams, fully built or kits, are assembled at Caterham in Dartford, east of London. 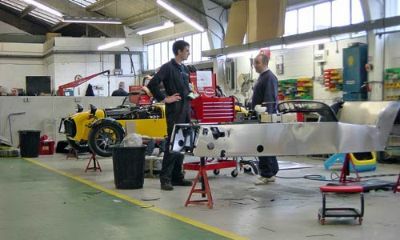 This is also where the Parts desk is located. 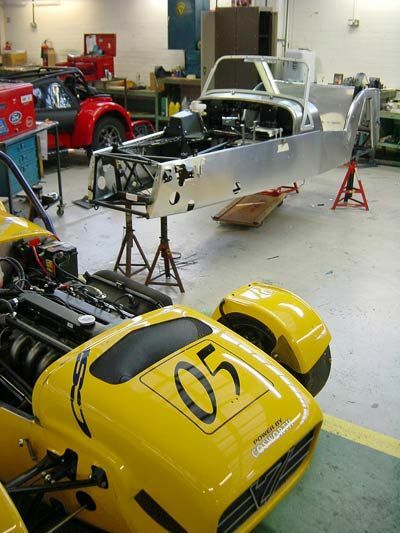 While picking up some parts from Caterham Dartford with Mark, we were very lucky to get a quick factory tour with Simon Lambert. 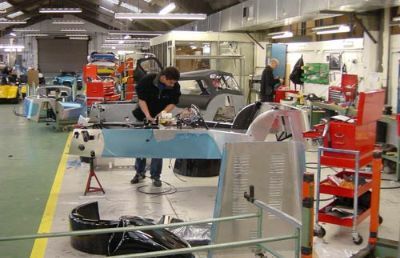 Factory tours are usually by appointment only, and only when it is quiet, so if you fancy one, ring ahead and check if it is possible. 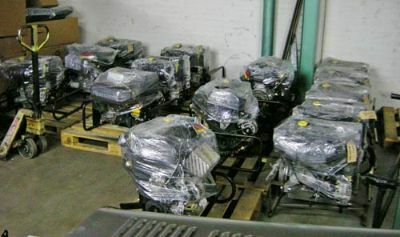 Pallets of engines, neatly wrapped in cling film! 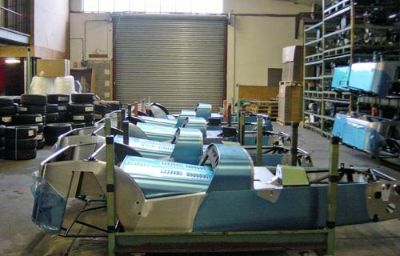 These chassis are kits, ready to be sent out to eager customers. 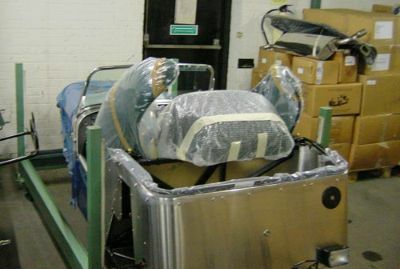 Wings are wrapped up and can e seen in the cockpit. Many of these particular kits are off abroad, many to France. 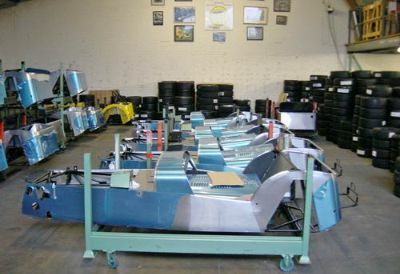 All parts and chassis are numbered with order numbers and destinations. 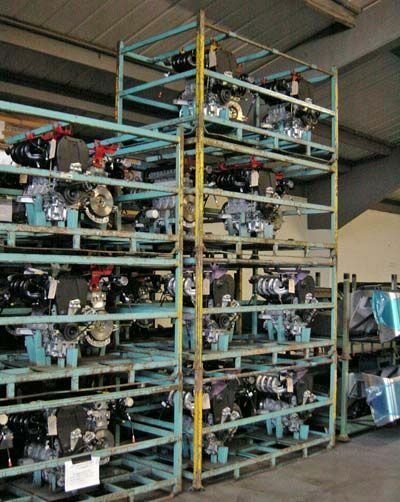 Stack of K-Series engines ready to fit. 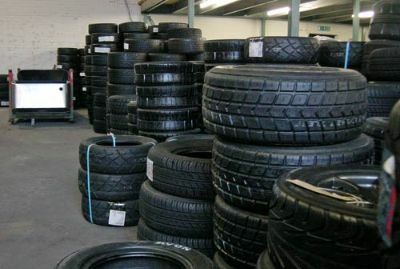 Lots of tyres! 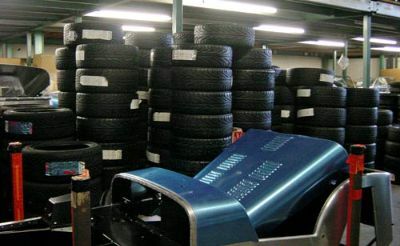 Simon had just been conducting tyre testing to establish what the new tyres would be like. Take your pick! A032's, CR500's and ACB10's visible here, amongst others. 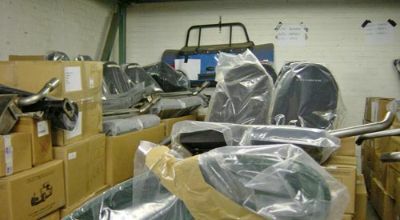 Seats, De Dion tube, exhaust system and nose cones visible here, along with many fittings boxes! Look - FLARED wings!! 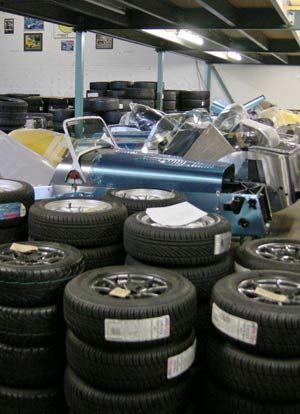 They do still make them - it is a legal requirement that they are supplied with kits sent to France. 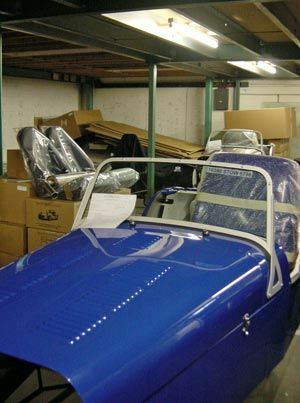 Rather nice blue car, due to be shipped to France to a lucky owner. 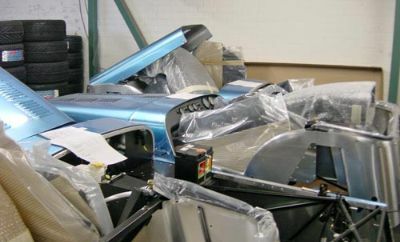 Note set of seat in the background, with exhaust system on top. 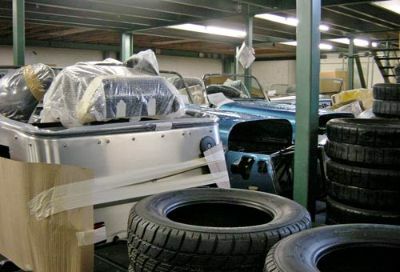 After looking around the storage shed, we moved back into the main building, where the assembly factory is located, behind the parts desk. 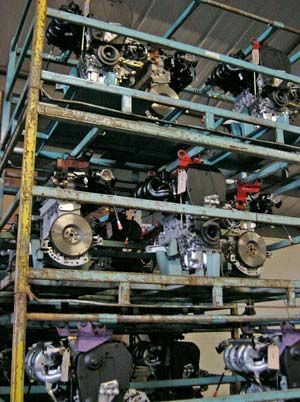 First view of the factory as you walk through from the parts department. 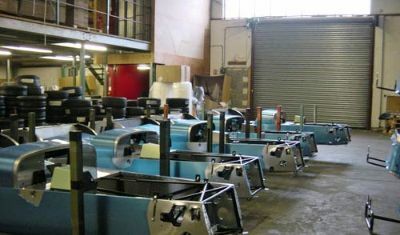 On the right hand side, chassis which are to be sent as kits are assembled. 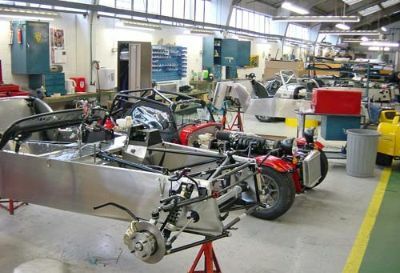 On the left, factory built cars are built up in the same way - it is just that they keep going until the car is finished! New CSR race car is in for a few repairs and tweaks. 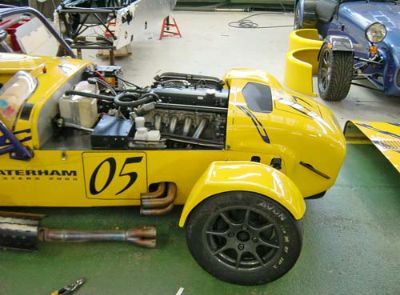 This is the car that Mark and I saw at the CSR launch, and one that has been used as a race development car. 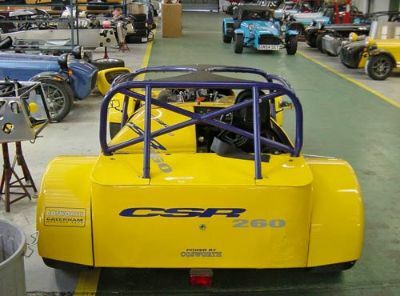 CSR, fitted with 2.3 Cosworth developed Duratec engine.